Airtel Issued Showcase Notice Over Blackout; D2h Forcing Republic TV? Airtel Slapped With Showcase Notice Over DTH Blackout; D2h Forcing Republic TV On Users? TRAI had earlier warned against any sort of blackout, by any DTH/Cable operator. Telecom Regulatory of India has repeatedly issued orders to all Cable and DTH operators over blackout of channels during the transition from old to new Cable TV regime. But still, several users of Airtel Digital faced blackout, and couldn’t access any channel. TRAI has taken a serious view of this incident, and have slapped Airtel with a showcase notice. Will this work? Meanwhile some users of D2h have complained that the are being forced to select channels such as Republic TV in their base pack of 100 channels. Airtel users have complained that they are not able to access any channel after February 1st. Several of them are on long-term annual packs, and most of them haven’t selected any new DTH pack. This is certainly against the regulations, as TRAI has time and again said that no cable TV user will experience any sort of blackout after Febraury 1st, under the new Cable TV regime. TRAI has listened to the customer woes, and have decided to treat this incident with strictness. Airtel Digital has been slapped with a showcause notice by TRAI, and have been ordered to explain this lapse in service. This is for the first time that a cable operator has been issued a showcase notice, for disrupting user-experience due to the new cable TV rules. Airtel has expressed their regret over this incidence, and have promised to rectify the matter. Airtel stated that they have 15 million users, and it may have happened that some users got their service blackout. Complaints have been posted by users for other DTH and Cable Operators as well, and it will be interesting to observe how TRAI deals with them now. D2h Forcing Republic TV Channel On Users? A Reddit user who has D2h connection has made a serious allegation against the service provider. 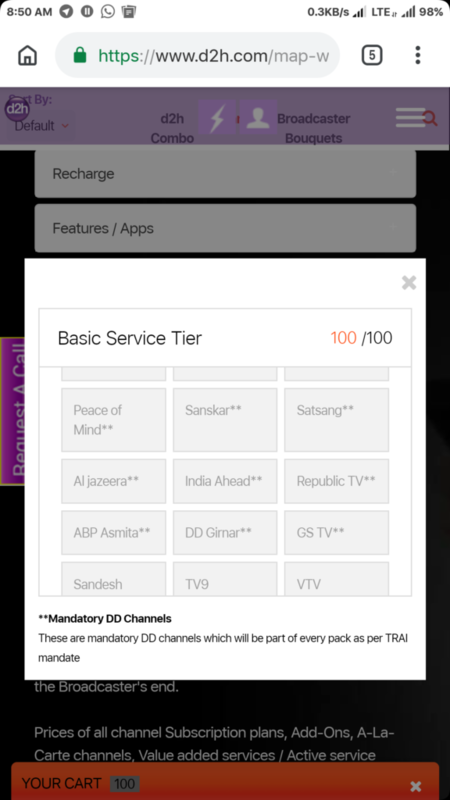 On a thread posted on Reddit India, user “Mikeross14” said that while selecting channels in the base pack of 100 channels (for which every user will pay Rs 130 plus GST), he was forced to select some channels by default, which included Republic TV. Republic TV is managed by firebrand anchor Arnab Goswami, and backed by BJP leaders. Besides Republic TV, channels such as Al Jazeera, TV9 and others were also selected by default, which cannot be removed by the user. Note here, that only DD channels (which numbers to 25) have to be mandatorily chosen in the base pack of 100 channels, for any DTH or Cable Operator. Here is a screenshot of D2h account, as shared by the Reddit user. Some users stated that this can be a software glitch as well, as there is no way a private channel can be forced on any DTH connection. Have you experienced such thing as well? Do let us know by commenting right here!